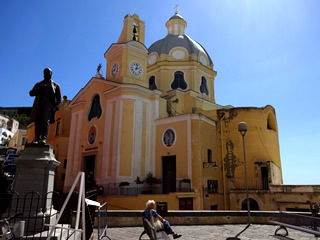 Staying in the Centro Storico in Naples we discovered the perfect pizza, a fabulous Caravaggio, manic street life, underground excavations, fantastic Roman mosaics, the bluest of seas around Capri and made a return visit to fascinating Herculaneum. Rarely do we take photographs of our meals but pizza and ice cream are highlights of a visit to Naples and I just couldn't resist! 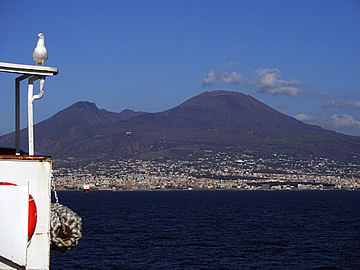 A fine view of Vesuvius leaving Naples on the ferry. 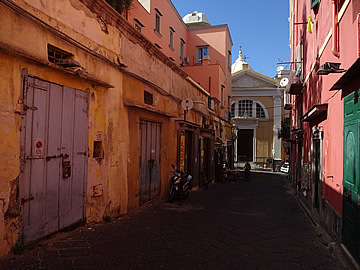 It was a blazing hot September in 2017 when we made our most recent visit to Campania and spent most of one day on Procida. 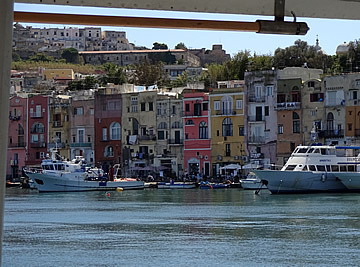 Docking at Marina Grande, Procida. 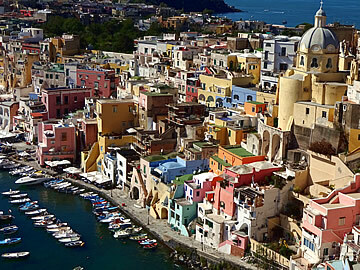 We took the ferry in the morning from Naples for the forty minute crossing to Procida. Mariba Grande where the ferry docks is an attractive place, looking very much untouched by tourism. 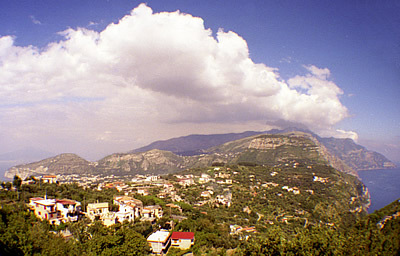 Santuario della Madonna delle Grazie, Coricella. 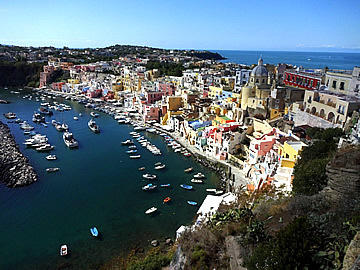 We walked across the island to Corricella on a beautiful bay facing south across the Gulf of Naples. It was very peaceful. 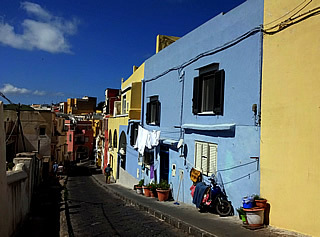 I don't know whether that was because it was out of season or it just isn't as much visited as the other islands but it was lovely and much nicer than the heaving hordes in the tourist spots of Capri. 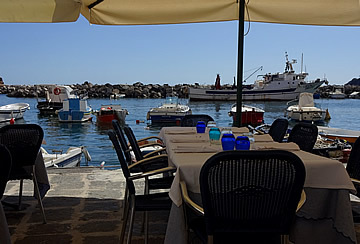 We walked down to Corricella's harbour where we knew there were lots of places to eat and sure enough, we were spoilt for choice. 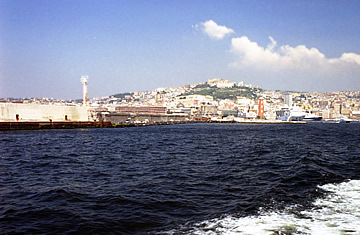 Corricella with the fortress of Terra Murata on the promintory. 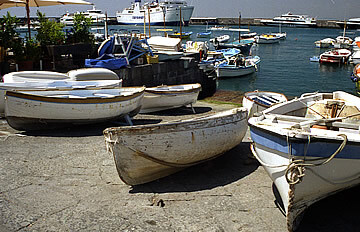 There is still a small fishing industry here. We settled on Caracale almost at the end of the harbour heading east. We had an excellent meal, though the squid in my squid, olive and cherry tomato salad was a bit chewy (why do I keep trying squid! Many years ago I had deep fried baby squid in Greece at a beachside restaurant and they were superb but very few since have come up to the mark!). Otherwise though - first class. Andrew's fresh tuna pasta and the grilled swordfish we both had were excellent. 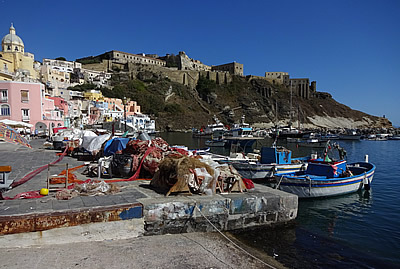 Afterwards we walked up onto the fortress promintory for a superb view of the harbour. 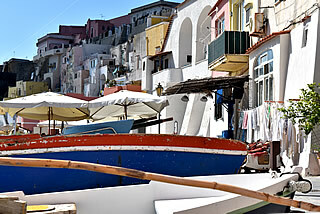 Then a slow walk back to catch the ferry to Naples. A very pleasant day. 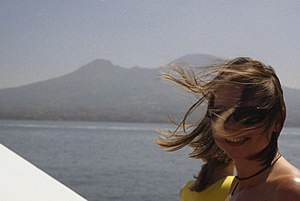 Rather windy on the boat but great views of Vesuvius. 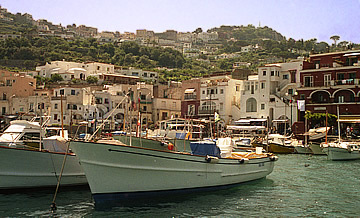 We took the fast boat one morning (2005) and landed on the island at Marina Grande, immediately embarking on a smaller boat for the Grotta Azzura - the famous Blue Grotto. 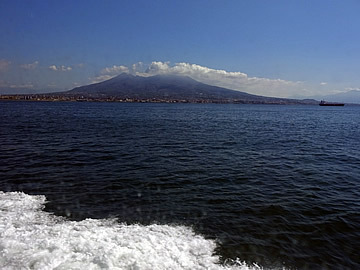 Leaving Naples on the ferry for Capri. 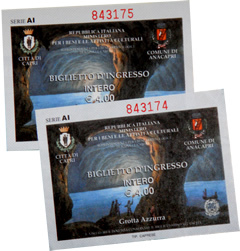 Fortunately the sea was as flat as a mill pond because the entrance to the grotto is via a very, very low rock cave. 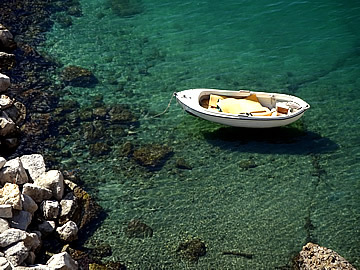 We had to get into a special rowing boat, of which there were many waiting to take tourists, then lie flat in the bottom of the boat as it passed under the cave entrance. 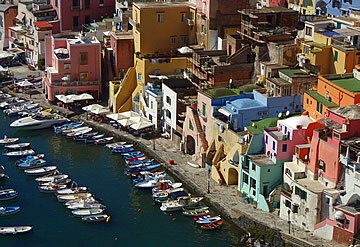 Inside it is magical - the wide expanse of water is an amazing, luminous blue. 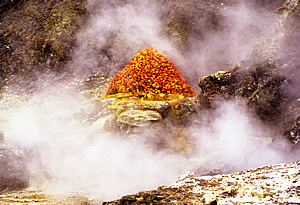 The fabulous colour is due to light entering via an underwater opening and travelling through the water to the surface. 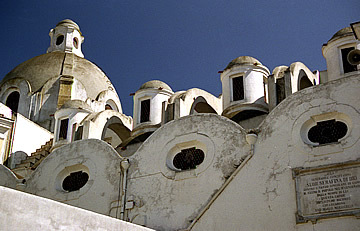 Church of Santo Stefano on Piazzetta. After lunch (pizza Margherita!) we explored the island a little. Piazza Umberto I at the top of the funicular from the harbour, otherwise known as Piazzetta, was crowded with tourists, but walk away from here in almost any direction and it soon becomes more peaceful. 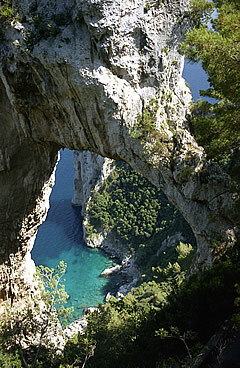 We walked up to Arco Naturale, an impressive natural rock arch high above the beautiful blue waters of the bay. 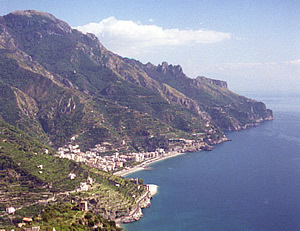 Vietri sul Mare in the foreground at the eastern end of the Amalfi peninsula. It was quite an experience driving these roads - overtaking on blind bends obligatory and sheer bravado a must - the road sign "Give way to overtaking traffic" says it all! 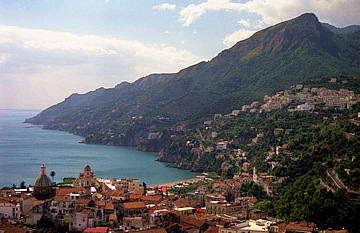 The roads are so narrow that in many places you can expect to be pulled in to the side of the road for as long as it takes the local bus/delivery wagon/truck to make the slow ascent to Ravello or wherever. Heaven knows what it's like at the height of summer! The views of the coast are stunning. 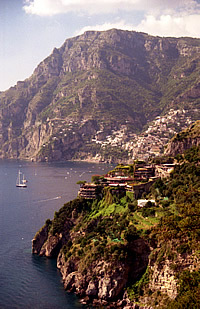 We drove along the southern coast, making a detour up a great switchback road to Positano, and then along to the western end and up over the top to Sorrento. Where the road zig-zags up over the end of the peninsula both the north and south coasts can be see - pretty spectacular! Then rather tired we headed back north east to complete the route. A long drive but worth it - this place is like nothing I had ever seen - or smelt outside a school chemistry lab! 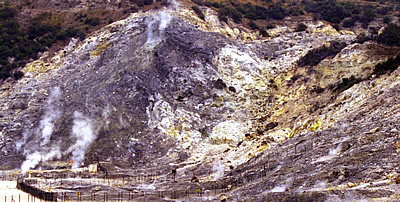 The Solfatara di Pozzuoli (entry L.8000) are part of the wider volcanic area known as the Phlegrean Fields. 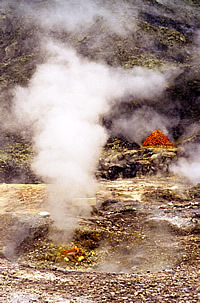 The ground alternates between bubbling, boiling mud and scorching rocks. 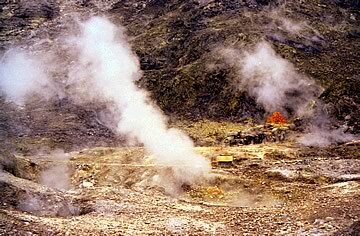 This is an "inactive" volcanic crater, from which escape sulphurous plumes of vapour - the fumaroles; at covered vents rumblings can be heard from deep underground. A yellow landscape and an atmosphere that stinks make this a fitting site for the Ancient Roman Gateway to Hell - less obviously the site of the Elysian Fields! 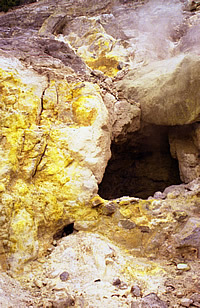 Beautiful sulphur crystals form all over the site, the most accessible examples being in the entrances to the two formations known as "Hell" and "Purgatory" - if you can stand to get into such a confined space. 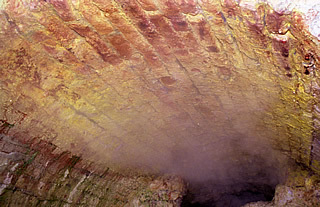 These brick tunnels were also used as natural saunas and the whole area had some reputation as a spa for its mineral waters and boiling mud rheumatic cures.